To work with restored files and folders, you can use Midnight Commander — a file manager that is included into the Veeam Recovery Media. With the Midnight Commander file manager, you can browse the mounted backup content and file system on your computer, and save restored files and folders to the original location or to a new location. To launch the file manager, in the File Level Restore wizard menu, select Start file browser and press Enter. If you use a volume-level backup for file-level restore, Veeam Agent for Linux detects the partition table in the backup, mounts to the /mnt/system directory block devices that represent volumes of your computer with the same names as volumes in the backup. For example, if your volume-level backup contains /dev/sda1 and /dev/sda6 volumes with / and /home mount points, Veeam Agent for Linux will mount to the /mnt/system directory both root (/) and /home partitions. 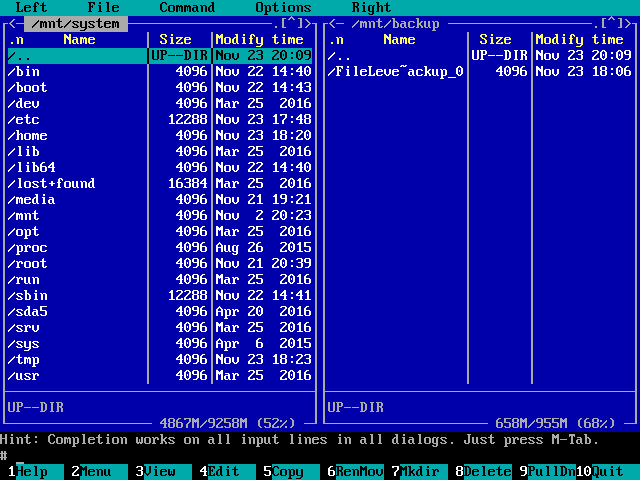 In Midnight Commander, press F10 to close the file manager. In the File Level Restore wizard menu, select the Switch to command line option and press Enter. Mount the target storage for the restored files and folders with the mount command. In the right pane, Veeam Agent for Linux displays a directory in which the backup content is mounted. Veeam Agent for Linux mounts the backup content under the /mnt/backup folder. After you finish working with files and folders, finish working with the Veeam Recovery Media.